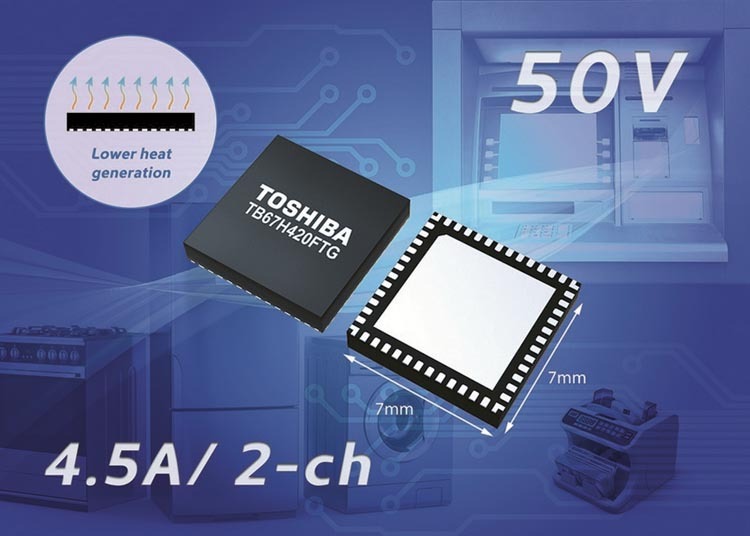 Toshiba Electronics Europe has broadened its line-up of small surface-mount brushed motor drivers with the addition of the new TB67H420FTG that supports high-voltage applications requiring a large-current drive such as domestic robotic vacuum cleaners, printers and other office equipment. The brushed motors used in printers and other office equipment, banking terminals, cash dispensers, and home appliances require a high power drive to produce the high levels of torque required. As more applications become automated and use motors, the demand for compact, space-saving solutions increases. Realizing high-power brushed motor drives requires a high-voltage output, which can strain the driver circuit. Also brushed motors are unique in that they require support for inrush current that, again, has the potential to strain drivers. Normally high-power drives are realized with mixed technology using an integrated driver and discrete switching MOSFETs. However, while this approach is valid, it increases the component count thereby increasing cost and size. The device is based on Toshiba’s latest 130 nm process technology and incorporates a single output bridge mode that can deliver up to 9.0 A at 50 V. It also has the ability to control two brushed motors (50 V, 4.5 A / 2 channels), as it incorporates a dual bridge mode that can control each channel independently due to two distinct output channels. The new TB67H420FTG brushed motor driver supports industry-leading high power drives and contributes to space saving due to its small QFN48 surface-mount package. The inbuilt MOSFETs have ultra-low on-resistance of just 0.17 Ω in single bridge mode and 0.33 Ω in dual bridge mode, thereby ensuring efficient operation and minimal heat generation. Alongside a current limiter and essential built-in error detections for over temperature, over current and under voltage lock out, the new driver also integrates a frequently requested error detection output, which flags any errors to the system, creating higher levels of safety. The new stepping motor driver also features Toshiba’s Advanced Current Detection System (ACDS) that monitors and controls current without the use of sense resistors, thereby saving PCB space and reducing BOM costs. Toshiba Electronic Devices & Storage Corporation considers the TB67H420FTG to be its flagship next-generation DC brushed motor driver, due to its advanced capabilities for realizing high-voltage and large-current drive, as well as its broad application base as a result of its dual bridge mode and error handling. Mass production of the new TB67H420FTG starts today.